"It's not easy sharing your man with the fire." In fact, it's not easy sharing anyone you love with the fire as Director Joseph Kosinksi's (Oblivion) Only the Brave proves. A searing portrayal of the 2013 Yarnell Hill Fire and the events leading up to it, Only the Brave is hard to watch. Not because it's bad, but because it's painful. Serving more as a memoir to the incredible men lost than as an outright tragedy, it's a beacon to rally behind our country's firemen. This, given the recent Northern California fires, is particularly paramount. The premise is simple enough. Craggy Eric Marsh (the quintessential Josh Brolin) wants to promote his "trainee" Hotshots to the real deal— he wants his squad on the front lines of the fires. To do this, it means hard and dirty work; locker room banter, brutal mountain trail runs, becoming brothers, and the occasional fight with horse whispering wives and worried mothers. It's easy to see the camaraderie between neighbors as this is a cowboy's town where beer, loyalty, and ethics tie everyone together. When Prescott, AZ finally gets its very own Granite Mountain Hotshots, there is work to be done and fires to out-fire (but not before a town picnic and barbecue to celebrate). However, the best parts of the film aren't the fire-fueled action sequences (though they are truly humbling), but the relationships. Eric and his wife, horse-trainer Amanda (Jennifer Connelly, who's understanding and compassion is nothing if not badass), are a dream pair and a force of love. Paralleled to them is drug addict and all-around flop Brendan (played by the exquisite and haunting Miles Teller) and his tightrope walking relationship with estranged ex, Natalie (newcomer Natalie Hall of True Blood). Torn apart by Brendan's addictions and grimy behaviors, these two young parents are ultimately sewn back together when Brendan chooses to join the Hotshots and become a good father. After weeks of earning Natalie's trust with doorstep diaper deliveries and staying sober, he gets to hold his baby girl for the first time, and its these moments when director Kosinski truly beams. Whether it's the romantic relationships or the brotherly ones (Taylor Kitsch's immature but endearing Mack is best friend you've always wanted), they wrap us right around their finger. In fact, Kosinski and debut screenwriter Sean Flynn made sure that it wouldn't be the fatal last trial to break us; instead it would be a stilted sentence in the front seat of a speeding truck, as Duane Steinbeck (not-so-humble mumbler Jeff Bridges) says to a wrought Amanda that things "are not good." The pain is not over-sentimentalized nor sensational. It's grounded in truth and for that it is incapacitating. Kosinski threads together each man's story in a cohesive and powerful way; from the steadfast and stubborn Eric Marsh to his loyal local government connection Duane to the wayward 21-year old new father Brendan "Donut" McDonough, these characters become a part of us. These brave men worked tirelessly to make something for their families and their town; Only the Brave's telling of this story would make any family member proud. 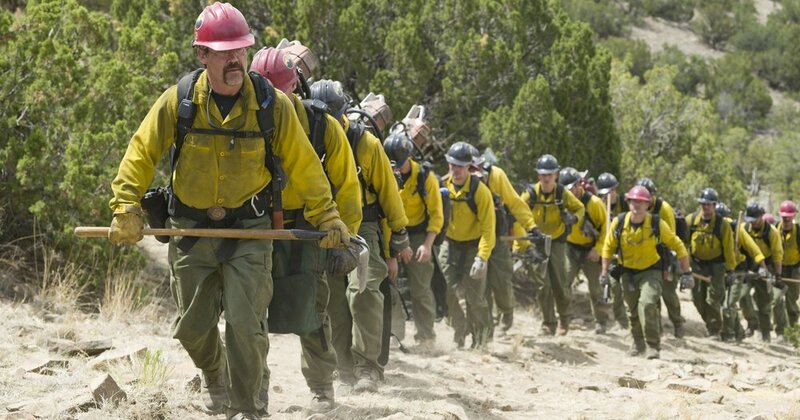 Though the end moves quickly, so do the fires, and Only the Brave is both an inspiring in-memoriam to the men we lost and an act of gratitude towards the men still fighting fire with fire. "Only the Brave" releases everywhere Friday, October 20th. For more information or to purchase tickets, visit here.